You may add any of the visual micro arduino commands to the visual studio tool bars and menus. You may also reference the commands in your visual studio macros. Serial ports, libraries, boards are also available as commands. 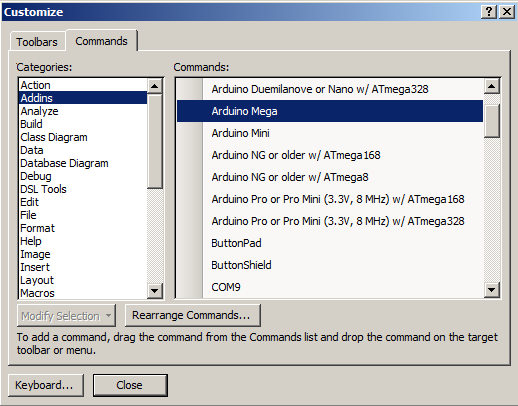 The "Arduino Mega" will appear as a visual studio command (Tools, Customise), COM23 (if it exists) will also appear as a command, the SoftwareSerial library will also appear as a command. Therefore you could add there new tool bar buttons for each providing a "one click" option to select options you use regularly. or you can create a workflow (macro) that automatically selects the "mega" board, sets COM23 and includes the software serial library into the current project.